Sybaquay Girls Scout Camp – Wetland Restoration and Buffer Enhancement | ENCAP, Inc. This project includes 53 acres of restoration and enhancement at the Sybaquay Girl Scout Camp outside of Harvard, IL in the Kishwaukee River Watershed. 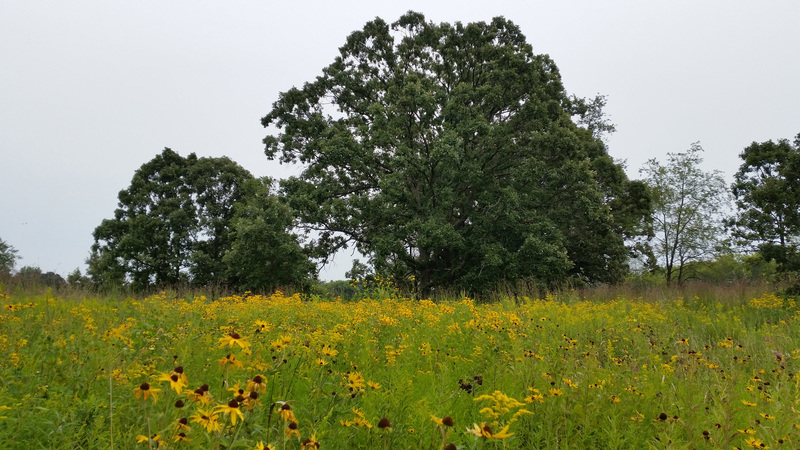 The project consisted of existing wet woodland and sedge meadow communities that had been drained through agricultural field tile and were surrounded by degraded old field upland areas and overrun with Common Buckthorn, Reed Canary Crass, and Thistle species. Project goals included restoring natural hydrologic conditions to the site, reintroducing a diverse native seed and plug mix to the site, and removal of invasive species. After the planning and development phase, initial restoration activities began in the late Fall/Winter 2005/2006 with woody invasive species removal and disruption and abandonment of the agricultural field tile on the site. The extensive buckthorn, box elder, and other invasive and undesirable woody species were controlled through hand clearing using brush cutters and chain saws with aquatic approved herbicide applied to the fresh cut stumps of the cleared woody species. Some larger black cherry, box elder, and cottonwood species were girdled with herbicide application to the cut girdle. The herbicide used was a Triclopyr based herbicide which was painted on each cut stump. In the first year of restoration activities, the site was seeded using a combination of drill seeding and hand broadcast seeding in areas where equipment access was difficult or impractical. A John Deere 4350 tractor and Truax Drill were used to seed the site in those areas that were mechanically drill seeded. Herbaceous plant plugs were also installed in the first year of restoration activities throughout the site as wetter hydrologic conditions became more prevalent with the abandonment of the field tile. The predominant invasive species which necessitated the most aggressive treatment included extensive Reed Canary Grass, various Thistle species, Wild Parsnip, Sweet Clover, and Buckthorn. These species were aggressively treated with backpack sprayers using an aquatic approved glyphosate or Triclopyr based herbicide depending on species to be controlled. Other annual and biennial weeds such as wild carrot and ragweed species were cut prior to setting seed using weed eaters or were spot mowed with a tractor mounted rotary mower. Resprouts and new seedlings of invasive woody species such as cottonwood, buckthorn, and willow were cut and stump herbicided in the dormant seasons of 2006-2007. Prescribed fire was introduced to the site 3 years after initial planting to reduce thatch, invasive species coverage, and promote native germination and development. The site has been under continued monitoring and maintenance by ENCAP, Inc. since its initial planting in 2006, and is under contract for stewardship through 2015. The site has seen redevelopment of diverse emergent wetland, sedge meadow, wet-prairie, wet-mesic prairie, and dry prairie habitats and has been successful in achieving the project goals of restoring and developing a diverse wetland complex to the property.